And the soft light of the rising desert sun rests for a moment across the towering sandstone walls of Zion Canyon before moving lower and lower on the walls as the big ball of fire gains height in the crystal clear, radiant blue sky. Morning. What an incredible time and place to sit, perhaps along the shore of the Virgin River, camera in hand, admiring this little world we call home, in an environment unlike any other. The same can be said for similar moments marking a calming sunset along the rim of the Bryce Amphitheater, where the irregularly eroded pink spires of rock, called hoodoos, take a glowing center stage. Those fortunate enough to exist in these moments are left awestruck and somewhat dumbfounded. In a good way. Providing these opportunities is what Backcountry Journeys upcoming “Canyons of Utah: Zion & Bryce” Photography Tour is all about. Beginning April 28th (and running through May 3rd), Russ, Crystal, Matt Meisenheimer and Kenton Krueger (hey, that’s me!) will be joining up with our intrepid guests/photographers to tour Zion and Bryce Canyon National Parks, hopefully to create lifelong shared experiences, not to mention some amazingly high quality images of what Utah’s two finest parks have to offer. 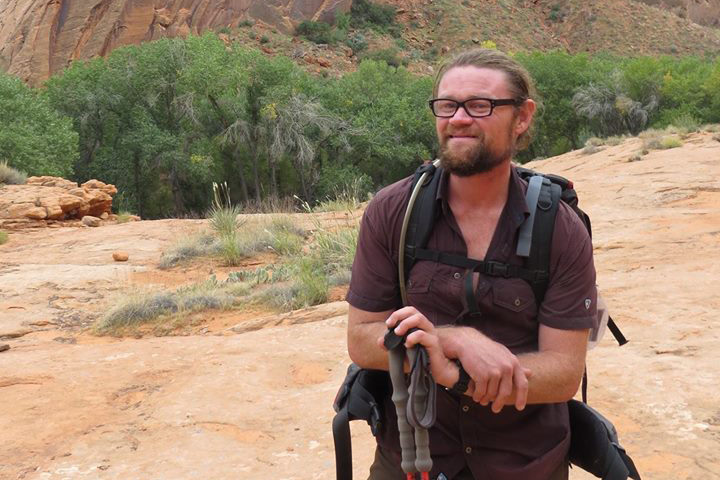 This will be Kenton and Matt’s first tour as guides for Backcountry Journeys, and we could not be more thrilled! So, we’re planning to document this tour in a three-part blog series. In this, the first entry, we’ll preview the Parks and the tour that is only a few short days away! While on the tour, we’ll file a blog post keeping interested folks back home abreast of how things are going, perhaps with a few photos we’ve managed to capture along the way. Afterwards, we’ll recap and recount the amazing tour, being sure to highlight any notable moments, events, meals, whatever the case may be! We certainly hope you enjoy reading, and will one day find yourself a part of future tours! This landscape photography oriented expedition will put us and our lenses in front of some of the most iconic and spectacular rock formations that Southern Utah has to offer. 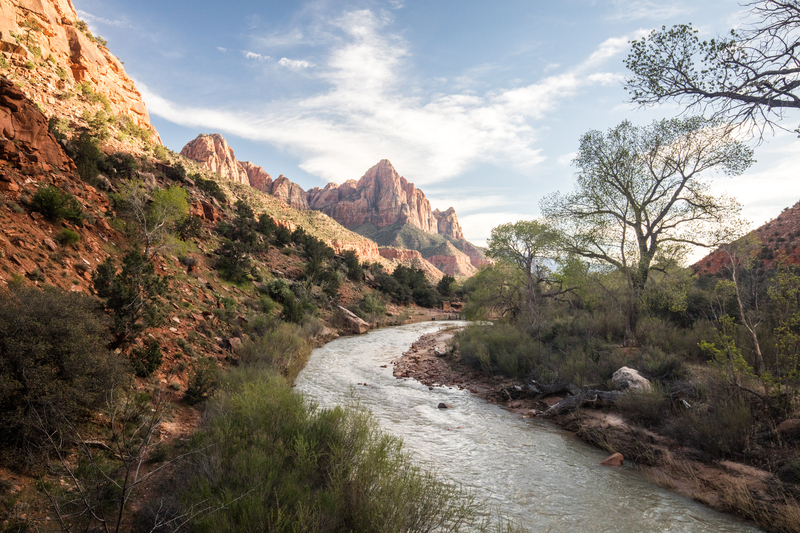 We’ll take a quick stroll to the mouth of Zion Narrows and photograph seemingly unnatural, but very natural landscapes. In the evenings following dinner, we may venture out to capture brilliant, star-filled skies above the canyons. It’s difficult to find a darker night sky(a real treat to the city dweller). So, what are these Parks all about? What’s in store for us? The towering walls of Zion Canyon seems to be what stands out most about the Park. The Canyon stretches 15 miles long and spans up to half a mile deep as it cuts through the reddish and tan-colored Navajo Sandstone by the North Fork of the Virgin River. The Navajo Sandstone is the result of the largest known sand desert in the history of our planet, which covered the area of today’s Colorado Plateau and beyond. It consists of thick layers of cross-bedded sandstone formed by windblown sand dunes in a vast ancient desert, and now forms the towering cliffs of the Canyon. These rock layers hold stories of ancient environments and inhabitants very different from those found in Zion today. In this distant past, Zion and the Colorado Plateau on which it resides (an area covering 130,000 square miles of northern Arizona, Utah, western Colorado and New Mexico) were near sea level, and actually close to the equator. Located at the junction of the Colorado Plateau, Great Basin, and Mojave Desert regions, the park has a unique geography and a variety of life zones that allow for unusual plant and animal diversity. Numerous plant species as well as 289 species of birds, 75 mammals, and 32 reptiles inhabit the park’s four life zones: desert, riparian, woodland, and coniferous forest. Zion National Park includes mountains, canyons, buttes, mesas, monoliths, rivers, slot canyons, and natural arches. This kind of diversity offers photographers a plethora of opportunity to make a variety of colorful and interesting images. Human habitation of the area started about 8,000 years ago with small family groups of Native Americans, one of which was the semi-nomadic Basketmaker Anasazi . Subsequently, the Virgin Anasazi culture and the Parowan Fremont group developed as the Basketmakers settled in permanent communities. Both groups moved away by 1300 and were replaced by the Parrusits and several other Southern Paiute subtribes. Mormons came into the area in 1858 and settled there in the early 1860s. In 1909, President William Howard Taft named the area Mukuntuweap National Monument in order to protect the canyon. In 1918, Zion (the name used by the local Mormons) was introduced as a name to replace Mukuntuweap. Congress, in the autumn of 1919, established Zion National Park. Situated along the eastern edge of the Paunsaugunt Plateau in southern Utah, and covering 35,835 acres, Bryce Canyon reaches towards the heavens at elevations over 9,000 ft. in elevation. The Park’s highlights are the signature hoodoos, held in a series of natural amphitheaters or bowls. 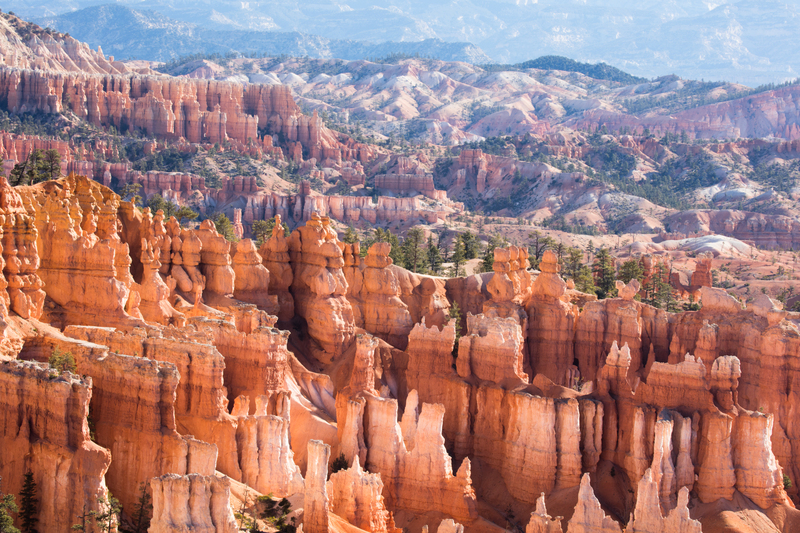 The most famous of these, the Bryce Canyon Amphitheater, reveals the long geologic history of sedimentation and erosion in a colorful sequence of rocks. The hoodoos, originally limestone deposits from a 200 million year old fresh water lake, have formed through frost weathering and stream erosion. The red, orange, and white colors of the rocks provide spectacular views, and more importantly for us, dynamic photographs. Archaeological surveys of the area indicate that people have been in the area for at least 10,000 years. Basketmaker Anasazi artifacts several thousand years old have been found south of the park. Other artifacts from the Pueblo-period Anasazi and the Fremont culture have also been found. The Paiute Indians moved into the surrounding valleys and plateaus in the area around the same time that the other cultures left. The Paiute believed that the hoodoos were the Legend People whom the trickster Coyote turned to stone. Mormon pioneers settled the area in the 1850s, later naming it after Ebenezer Bryce, who homesteaded in the area in 1874 and lived in the area for five years. The area now known as Bryce Canyon was originally designated as a national monument by then President Warren G. Harding in 1923, redesignated as Utah’s second national park by Congress in 1928, roughly 9 years after Zion. Whether we’re capturing the play of shadows along canyon walls, or focusing in on a secret oases of trickling water, the pink bloom of a prickly pear cactus, or finding interesting animals being their interesting selves, Zion’s treasures are simply endless. And during this tour we’ll be counting our blessings while engaged in what should be one of the more memorable times of our lives. Stick with the Backcountry Journeys blog to find out what’s in store!